With the World Championships just round the corner, Germany has lost one of its best medal prospects. Reigning World Marathon Majors champion Irina Mikitenko has withdrawn. Mikitenko has been unable to train effectively since the recent death of her father. In one of the US’s most historic road races, the CIGNA Falmouth 7-miler, Colleen de Reuck's placed fifth. De Reuck (45) still races incredibly; she won Falmouth in 1993 and 1997 and a dozen years later she still has the ability to finish in the top five. 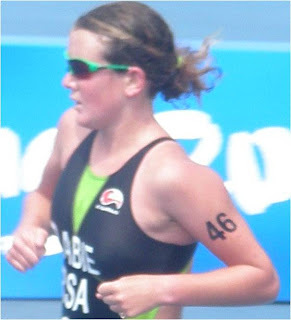 It was good to see South African triathlete & Olympian, Mari Rabie, run 38:20 for 10km in South Africa. She is a great talent & has had some challenges in recent years – I hope she continues with her return to top form & again represents South Africa in London in 2012. 2. Stephen Pifer, Eugene, OR (Oregon TC Elite) 3:58. Donohue’s time is a world-leading performance. For many years women had to struggle to run the marathon at the Olympic Games (they were only allowed to run the 1500 m in 1972 and the 10000m only in 1988). They finally had an opportunity in 1984 in Los Angeles – and Joan Benoit grabbed it to beat the three favourites, Grete Waitz, Ingrid Kristiansen and Rosa Mota, in 2:24:52. Most remarkable about Benoit’s victory in the LA heat was not that she set a world record, but that she had arthroscopic surgery to her right knee 17days prior to the Trials. This record stood until 2000. Benoit (now Samuelson) still runs around 50-60 miles per week and has decided to compete in the ING New York City Marathon in November. Her last marathon was last year in Boston, where she set a US 50+ record of 2:49:08 (she has won the race twice). Commenting recently on the fact that the 25th anniversary of her Olympic win coincides with the 40th running of the New York race, she said: "This will be more than a jog down memory lane. This is the incentive I needed to get out there one more time."